I'm so grateful for them. They've brought so much love into our lives. Kisses and wiggles every day. 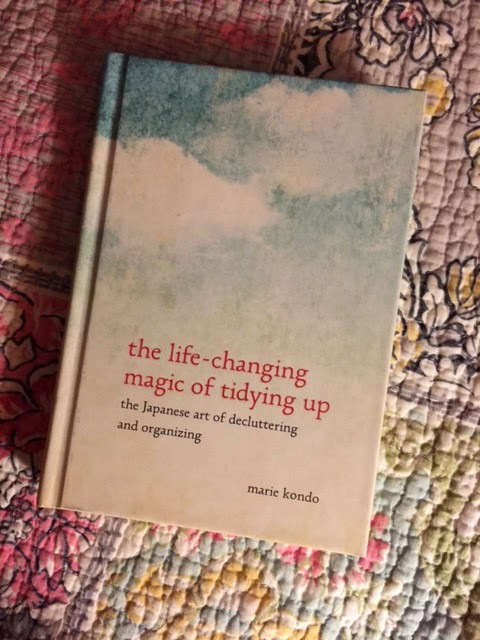 I wrote a couple of posts about the Life Changing Magic of Tidying Up by Marie Kondo on previous posts here and here. Marie's tidying method is known as The KonMari Method. 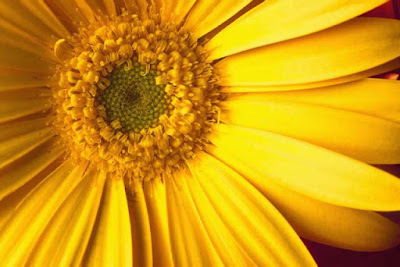 In a nutshell, if something doesn't spark joy within you, get rid of it. Cleaning out my closet (well, technically, 2 closets, a chest of drawers, plus out of season stuff stored under my bed) took me a solid day and a half and was pretty draining. But it also felt great to say goodbye to stuff I never really pay attention to anymore anyway, and then drop off about 5 big garbage bags full of clothes to the local Goodwill. Win/Win! Marie Kondo suggests that after you finish tidying your clothes, you move on to books. 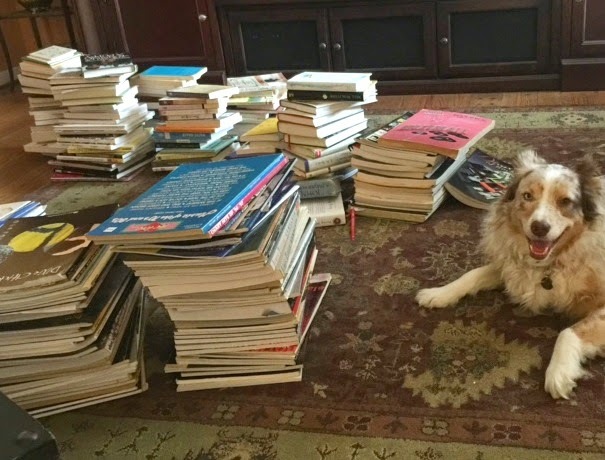 According to her research, she says books are one of the 3 things people find the hardest to let go. If you know me at all, read this blog, or follow me on Instagram, you know I'm an avid book reader, and a big fan of my local library. I get most of the books I read from the library. Occasionally I download a book not available thru the library for my Kindle. Only rarely do I buy a physical copy of a book. So I figured I didn't have that many books to even contemplate keeping or not. 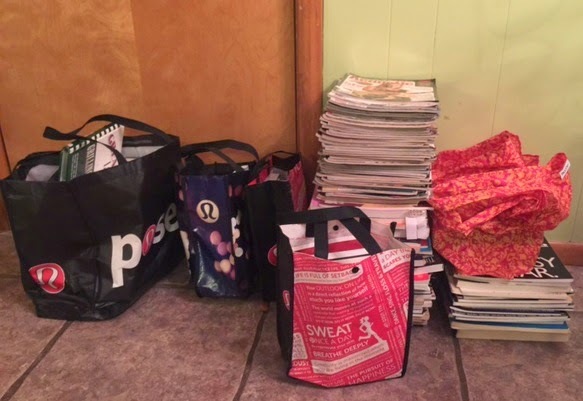 As with all categories for tidying using the KonMari Method, I gathered all the books in my house into one central location for my purge- cookbooks from the kitchen, books on the bookshelf in our office, in my studio, and a few in random spots around the house were all included. Sure enough, I had more books than I realized. I think that's the importance of laying everything out in once central space: You see just how much you possess. It's usually a surprising amount. I think it's always more than you think. My collection of books (pre-purge)- Small compared to most, I'm sure. Just like with clothing, you're suppose to look at each and every book asking yourself, "Does this spark joy?" Marie's overall thoughts about books you might eventually read, or the ones you might read again: If you haven't read it yet, you probably won't. And years down the road, if you do decide to, just buy another copy. (Or get it from the library!) If you've already read it, liked it and think you might just read it again? More than likely, you won't. Most books don't get a second reading from the same person. Pass those along to a friends or book-loving strangers! I ended up getting rid of tons of songbooks. I've memorized the songs in them that I want to play, at this point. If not, it's easy to find music online these days- for free. I also got rid of paperbacks that didn't hold meaning for me- some I had read, some not. I got rid of all but my favorite cookbooks. You can find so many free recipes online these days, I decided I just don't need all those cookbooks anymore. I did however, hold on to some books because they are very special to me- Some childhood books, and some very meaningful novels that I loved so much, just having them take up space on my bookshelf truly does spark joy! I wound up with several bags and boxes of books to sell at Half Priced Books. I wound up with about $60 I didn't have before, and now, those books can find their way to someone who will read them with fresh eyes. Books are meant to be read. That's when books feel happiest! Thanks to the KonMari Method, these books can continue to fulfill their destiny and find someone to read them! 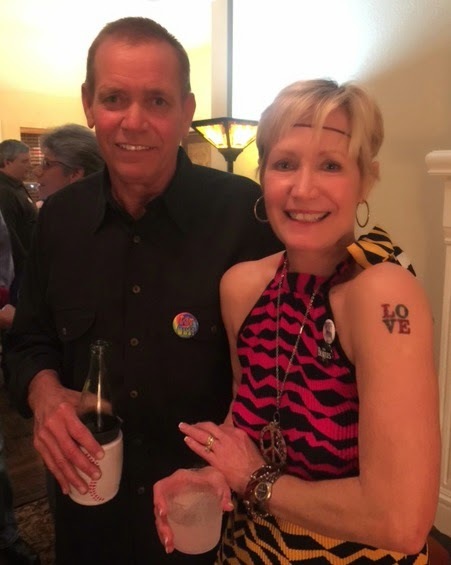 This past Friday night, we went to our friend's birthday party-- and not just ANY birthday: Her 64th. 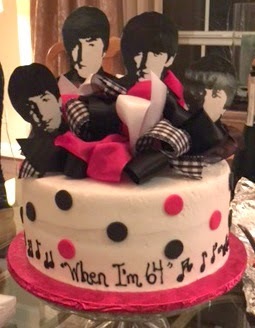 So, of course, it was Beatle-themed. I'm sure when Paul came up with the lyrics for this song, 64 seemed like a ripe old age. But to see Joyce, her husband and friends (many who I suspect are around the same age) at her birthday party the other night, 64 is clearly just a number that sang well and doesn't represent old age at all. As you can see, Joyce is still a lovely Spring chicken! Joyce and her husband, Reed- who still need and feed each other! So, with no further ado, here's "When I'm 64" by The Beatles, of course! Ever since a my friend told me about Serial (which, like everyone else, I got immediately hooked on), I've been diving into the world of podcasts. And it's a big, wide, beautiful world. I use to listen to music when I ran (or walked or lifted weights). Then I started listening to audio books. They had to be non-fiction or I just couldn't follow along for some reason. Then, as mentioned, Serial fell into my life. And now, it's all podcasts, all the time! You can find good podcasts on just about any subject your interested in. Go ahead, and check it out right now. 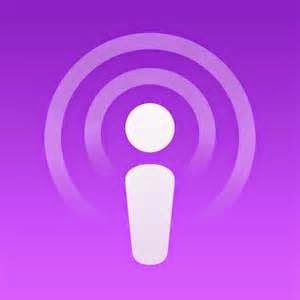 Go to the purple mic icon (if you have an iphone, which is all I know), and use the search tool to find podcasts about anything and everything. See?! They're portable. Unlike a video, or a blog, you can listen to podcasts while running, walking, working out, gardening, commuting... If you've got a little time to fill, there's a podcast to fill it with it! They tend to be 30 minutes to an hour in length, per podcast. It's not a huge, ongoing committment the way some audio books are. Some of those audio books I listened to in my pre-podcast days were 12 CDs long. I had to load them on my computer, and then listen. And listen. And listen. Sometimes, it tooks weeks to hear a whole book. That's a heavy load for a brain like mine. ;) Sometimes, shorter is better. I can listen to an entire podcast (sometimes 2) in the course of my daily workouts. They're FREE! All the podcasts I listen to are free. 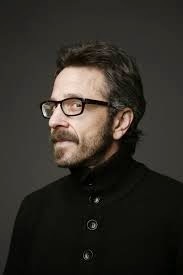 With the exception of the "premium package" I upgraded to for the Marc Maron WTF podcast...because he's just so awesome, I wanted to pay and have 500 episodes to chose from, because 50 just wasn't enough. Right now, my number 1 favorite podcast is the one I mentioned above- WTF with Marc Maron. Marc's a stand up comic that I didn't know of because I don't know much about the stand up world. He interviews a new guest each week. But rather than feeling like your listening to an interview, it feels like you're eavesdropping on great conversation between two (usually) funny people. He interviews lots of comics (well-knowns, and not-so-well-knowns), but also musicians, actors, film makers. I love Marc, and now feel like I know him. So if you're not a podcast listener yet, you might want to check into them. It's a big, wide, beautiful world out there. And there's something for everyone. I mentioned the book, The Life-Changing Magic of Tidying Up by Marie Kondo, in a recent post. The title isn't misleading. It IS life-changing. Purging and clearing out your living area gives you more room (literally and metaphorically!) for the things you love the most. The Marie Kondo's tidying method, known as the Konmari Method, is actually quite simple. When going through your possessions, if something doesn't spark joy, let it go. The first suggested category to attack is clothing. (Kondo suggests tidying by category rather than by room.) You are to gather up all your clothes- including out of season clothes, clothes in drawers, and in closets, etc., and put them all in one spot. Then pick up each item, piece by piece and ask yourself if it truly sparks joy. If not, either donate (prefereably), or just toss it. Let's say you have a cashmere sweater you bought 3 years ago at a great sale, but yet, you have never worn it because it's just not YOU. Marie Kondo says you just say something like this to that item of clothing, "Hey Cute Cashmere sweater, Thank you so much for that happy day you gave me when I bought you and I felt like I had really scored! I'm gonna remember that great feeling, but I'm gonna send you out into the world so someone who will really connect with you can wear you. I don't want you to feel neglecting in my closet any longer. So long!" And then off you go, to the donation center. You're now going to make someone else very happy when they find a cashmere sweater at the thrift store! The clothing category took me hours and was exhausting. I clean out my closet fairly often, so it was surprising that I got rid of so many clothes using the Konmari Method. But I did! And Lucy looked on in wonder. The egg roll folding method- I can see all my folded clothes now! 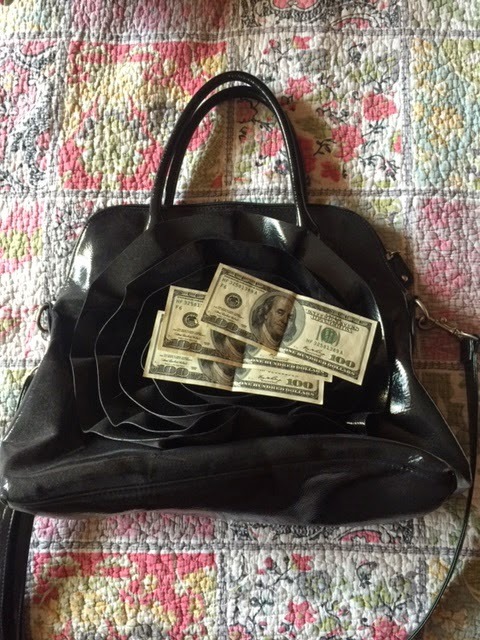 That day, I also went through all of my handbags and purses, making sure each one that I kept still sparks joy in me. One that no longer does, is this large black flower purse made by Big Buddha. As I was checking the inside before throwing it in the donation pile, I found 3 crisp 100 dollar bills inside! WHAT?! I have no idea how or why that was in there, but I like to think it was the purse just saying, "Thank you for my freedom. I can't wait to find someone that will carry me around and put me to good use. This is worth at least $300 dollars to me to get to leave your dark closet for the first time in years!" I finished purging and then organizing my clothes and assesories a few weeks ago. Since then, everything has stayed very organized. However, the other day, I found a large under-the-bed sweater storage container I had forgotten about. Ugh. Although I was happy to see the sweaters, at the same time, they bummed me out. I had gotten down to just the perfect amount of clothing, but now, I'm feeling like it's a bit too much again. I did get rid of 3 of those sweaters, but it's still too much I'm hanging on to. Marie says you may continue getting rid of more and more, and then finally one day it will click and you'll know you've reached the proper amount that you feel comfortable with. 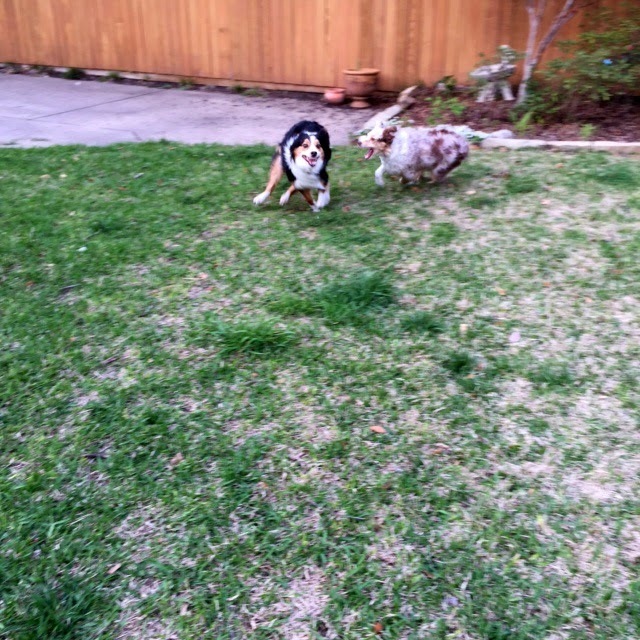 Although it is a process, she does encourage doing it all pretty quickly and then being done with it. It should feel life-changing. It should feel drastic! 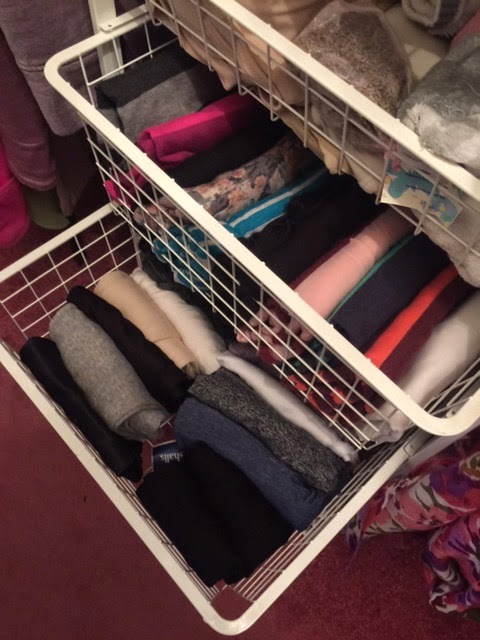 So that's just a little bit about my process using the KonMari Method of tidying up! More to follow, in upcoming posts!